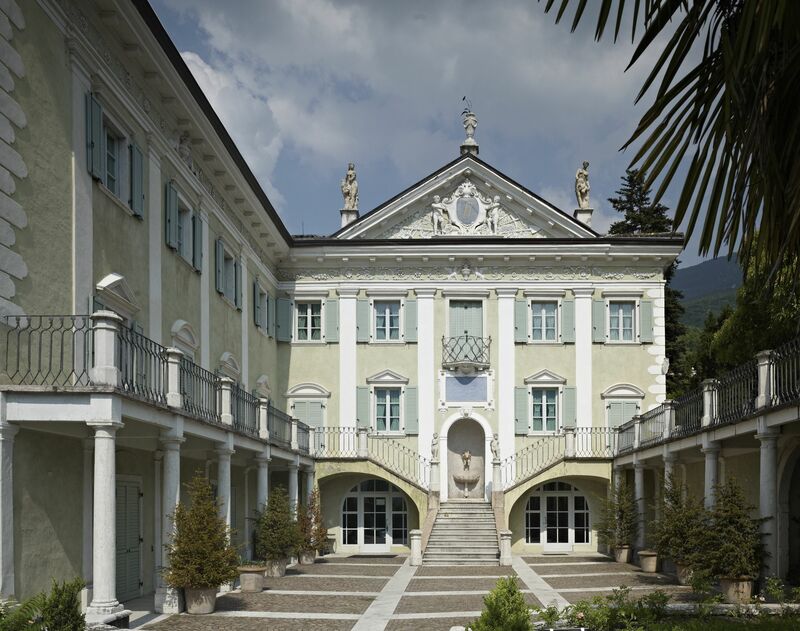 The workshop will take place at the ECT* center located in Villazzano, a small village in the suburb of Trento, the capital of the Autonomous Region of Trentino and Alto Adige and the Autonomous Province of Trentino. The site is known to locals as "Villa Tambosi", which is the name of the late XVIII century villa where ECT* is based. By airplane. The nearest airports, in order of proximity, are Verona, Bergamo, Venice, Milan and Bologna. In order of importance, the list is basically reversed, being Milan, Venice, Bologna, Verona, Bergamo. Usually, once at the airport, one continues to Trento taking a train (see below) from the nearest station. Notice that in this case we strongly recommend to purchase tickets at the railway-ticket offices in the airport upon arrival, in order to avoid lines at the railway station or to buy online on the Italian railways website. Milan. Milan has two international airports: Linate (mostly for European and internal flights) and Malpensa (mostly for overseas flights). Once at the airport there is a bus shuttle service to Milano Centrale railway station (about 25 min. from Linate and 1 h 15 min. from La Malpensa). From there one can take a train to Trento usually via Verona. Venice. Venice has an international airport (Marco Polo) located in the nearby city of Mestre. Once there, a bus service to the railway station in Mestre (25 min.) is provided; from there you can catch a train to Trento via Verona, or alternatively, the direct Valsugana line to Trento. Bologna. Bologna features a relatively big airport (Guglielmo Marconi). There is a bus shuttle to the railway station - Bologna Centrale - from where there are both direct regional trains and direct high-speed trains (Freccia Rossa o Argento) to Trento or via Verona. Verona. Verona international airport Valerio Catullo, has daily flights to and from many European cities including Paris, London, Munich and Barcellona, as well as several flights to Rome and other major Italian cities. Once at the airport, there is a bus shuttle service to Verona railway station Porta Nuova (there is also the possibility to go there by taxi for about € 25). From there, there are trains to Trento every hour. This is probably the most convenient airport for reaching Trento, and overseas travellers should consider the possibility to fly to Verona via London (Gatwick), Paris, Munich, Brussels, Amsterdam, Madrid, Barcelona, Vienna, Rome, or Frankfurt. Bergamo/Brescia. Bergamo (Orio al Serio) is an airport which provide slots for cheap flight carriers from and to several European cities. A bus shuttle to the railway station of Bergamo is provided. Next one can catch a train to Trento via Verona. By train. Trento is on the Innsbruck-Brenner-Verona line (Munich-Trento ca. 5 hours). This line crosses the Milan-Venice line in Verona (Milan-Trento and Venice-Trento ca. 3 hours; Verona-Trento ca. 1 hour). For the ones coming from (or going to) Venice, there is also the possibility of taking the scenic Valsugana line (Venice-Trento direct, ca. 3 hours). The latter trains stop in Villazzano, 200 m. from ECT*. The Italian train time table is subjected to year and seasonal variations, so we cannot provide it. However you can get all the information you need at the Italian railways server (broader information is provided by the Deutsche Bahn server). Remember to validate your train ticket in the yellow boxes located en route to the platforms prior to boarding, both going and returning, or you will be fined. By car. Trento is on the motorway connecting Munich-Innsbruck-Verona-Modena (A22). You should exit the A22 highway at Trento Sud, and then follow the indications for Villazzano (See also the map below). Better still, follow your GPS (the address of the centre is Strada delle Tabarelle 286, Villazzano). By car. Follow your GPS or ask Google maps to make a route for you from your current location to ECT* (Strada delle Tabarelle 286, Villazzano). By bus. When exiting the railway station, you will see a park in front of you, called Giardini Piazza Dante. Walk straight across the park and you reach via Alfieri. The bus stop for bus No.6 is in via Gazzoletti. (Do NOT take bus No.6 on the landing in front of the station. That bus goes in the wrong direction.) Take bus No.6 and get off the bus in Villazzano at the "Villa Tambosi" stop, which is immediately after a roundabout. The entrance to the Centre is the first gate on your right. The service starts between 5 a.m. and 7 a.m., and finishes between 7.30 p.m. and 10.30 p.m. Timetables and itineraries are listed at the bus-stops. Tickets can be purchased at a tobacconist or in the newspaper shop in the station (a single ticket costs € 1.20) or directly on the bus. By taxi. There is also a taxi service in front of the Railway station (Tel. +(39) 0461 930002). Cost of a ride from downtown Trento to ECT* is about € 15.